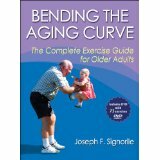 In his book, “Bending The Aging Curve,” Joseph F. Signorile, PhD, makes powerful and enlightening statements on the aging, which spotlight the aspects of the normal downward trajectory as years pass by. Slowing down as we age is not only a matter of retirement, changing lifestyles or the desire to take it easy during the later stages of life. In fact, slowing down is actually a component of the combined loss of muscle size, strength and speed. Basically, we become weaker, slower and less powerful as we age. Aging without exercise will encourage the loss of muscle fibers, more importantly, the loss of fast-twitch muscle fibers. These are the fibers that atrophy and become weak. Fast-twitch fibers are used when standing up from a chair with vigor, staying on your feet, walking with energy and lifting heavy objects. Simply said, the more fast-twitch muscle fibers we lose through aging, we more we lose our physical power (a combination of strength and speed). For instance, a great example of “loss of power” is seen when standing up out of a chair and needing to use a push of the hands while looking down, followed by a crash landing when sitting back down. The good news is with proper exercise of first building strength and tissues, then adding speed/power training will result a reversal of some of the lost high-speed muscles. With the higher percent of hi-speed muscle fibers, falling down episodes would less likely occur. Instead, a stumble will result in regaining balance and posture instead of landing on the floor. If the floor does make an appearance, then the ability to push off the floor is greatly enhanced. Getting off the floor takes strength and speed, which equal power. Training for power as we age must be the main focus in an exercise program. “Bending the aging curve” exercise program must include short bursts of intensity with adequate recovery. Designing the perfect “aging” workout is an art based on science. Each person has a unique “fitness” painting, which is best developed over time with readjustments created based on results.